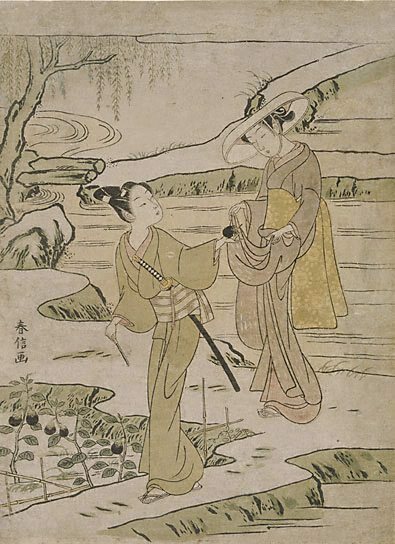 Harunobu was one of the geniuses of 'ukiyo-e'. He is famous not only for the invention of the full-colour print, but also for the creation of images of sweet young beauties, as opposed to the sophisticates of the entertainment district. The Asian Collections, AGNSW, 2003, pg.248. Signed c.l., in Japanese, ink [incised on block] "Harunobu ga [picture by Harunobu]". Not dated. The Asian Collections Art Gallery of New South Wales , 'The Floating World', Sydney, 2003, 248 (colour illus. ).